Map projections are necessary for creating maps. 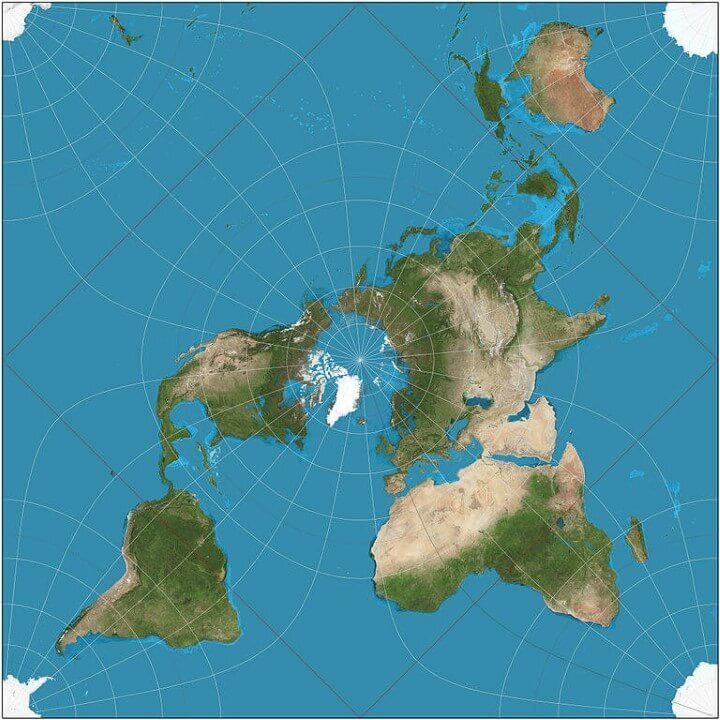 All map projections distort the surface in some fashion. Depending on the purpose of the map, some distortions are acceptable and others are not; therefore, different map projections exist in order to preserve some properties of the sphere-like body at the expense of other properties. There is no limit to the number of possible map projections. The comic above by Randall Munroe at XKCD looks at What your favorite map projections says about you (assuming you have one). What it says about you: You’re not really into maps. The Mercator projection is a cylindrical map projection presented by the Flemish geographer and cartographer Gerardus Mercator in 1569. It became the standard map projection for nautical purposes because of its ability to represent lines of constant course, known as rhumb lines or loxodromes, as straight segments that conserve the angles with the meridians. The two properties, conformality and straight rhumb lines, make this projection uniquely suited to marine navigation: courses and bearings are measured using wind roses or protractors, and the corresponding directions are easily transferred from point to point, on the map, with the help of a parallel ruler or a pair of navigational protractor triangles. Mercator projection distorts the size of objects as the latitude increases from the Equator to the poles, where the scale becomes infinite. So, for example, Greenland and Antarctica appear much larger relative to land masses near the equator than they actually are. Source: Mercator projection on Wikipedia. What it says about you: You’re not a complicated person. 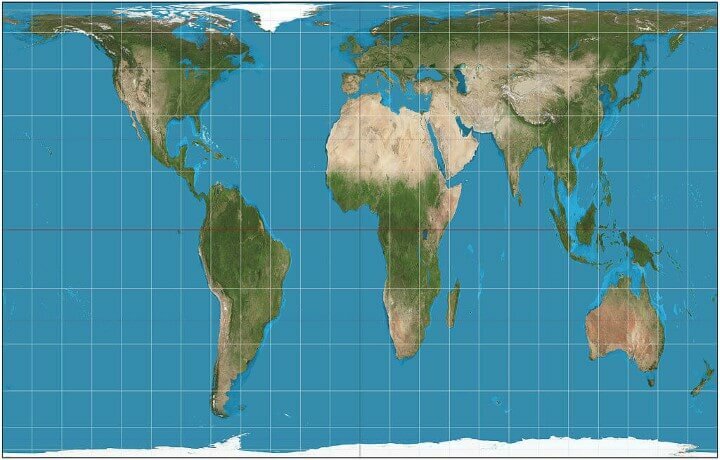 You love the Mercator projection; you just wish it weren’t square. The Earth’s not a square, it’s a circle. You like circles. Today is gonna be a good day! The van der Grinten projection is a compromise map projection that is neither equal-area nor conformal. It projects the entire Earth into a circle, though the polar regions are subject to extreme distortion. It was made famous when the National Geographic Society adopted it as their reference map of the world from 1922 until 1988. […] polar regions are subject to extreme distortion… is an arbitrary geometric construction on the plane. What it says about you: You have a comfortable pair of running shoes that you wear everywhere. You like coffee and enjoy The Beatles. You think the Robinson is the best-looking projection, hands down. 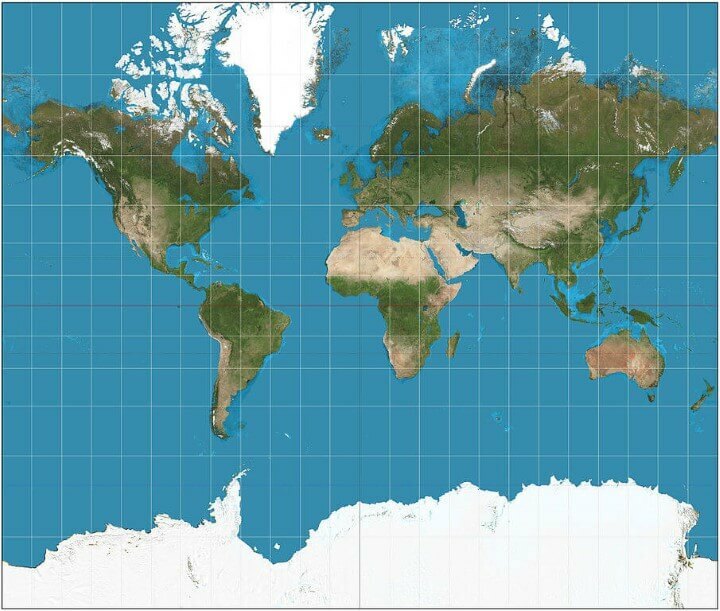 The Robinson projection is a map projection of a world map which shows the entire world at once. It was specifically created in an attempt to find a good compromise to the problem of readily showing the whole globe as a flat image. The Robinson projection is neither equal-area nor conformal, abandoning both for a compromise. The creator felt this produced a better overall view than could be achieved by adhering to either. The meridians curve gently, avoiding extremes, but thereby stretch the poles into long lines instead of leaving them as points. […]distortion close to the poles is severe, but quickly declines to moderate levels moving away from them. The straight parallels imply severe angular distortion at the high latitudes toward the outer edges of the map. What it says about you: You like Isaac Asimov, XML, and shoes with toes. You think the Segway got a bad rap. You own 3D goggles, which you use to view rotating models of better 3D goggles. You type in Dvorak. The Dymaxion map or Fuller map is a projection of a world map onto the surface of an icosahedron, which can be unfolded and flattened to two dimensions. The flat map is heavily interrupted in order to preserve shapes and sizes. More unusually, the Dymaxion map does not have any “right way up”. It is not a gnomonic projection, whereby global data expands from the center point of a tangent facet outward to the edges. What it says about you: National Geographic adopted the Winkel-Tripel in 1998, but you’ve been a W-T fan since long before “Nat Geo” showed up. You’re worried it’s getting played out, and are thinking of switching to the Kavrayskiy. You once left a party in disgust when a guest showed up wearing shoes with toes. Your favorite musical genre is “Post–”. The Winkel tripel projection (Winkel III), a modified azimuthal map projection of the world… The projection is the arithmetic mean of the equirectangular projection and the Aitoff projection: The name Tripel (German for “triple”) refers to Winkel’s goal of minimizing three kinds of distortion: area, direction, and distance. […] the Winkel tripel fares well against several other projections analyzed against their measures of distortion, producing small distance errors, small combinations of Tissot indicatrix ellipticity and area errors, and the smallest skewness of any of the projections. The lines of latitude in Winkel Tripel they are slightly curved and non-parallel. The Winkel Tripel projection is not equidistant; there is no point or points from which distances are shown accurately […] The Winkel Tripel projection is not azimuthal; there is no point or points from which directions are shown accurately. What it says about you: They say mapping the Earth on a 2D surface is like flattening an orange peel, which seems enough to you. You like easy solutions.You think we wouldn’t have so many problems if we’d just elect normal people to Congress instead of Politicians. You think airlines should just buy food from the restaurants near the gates and serve that on board. You change your car’s oil, but secretly wonder if you really need to. 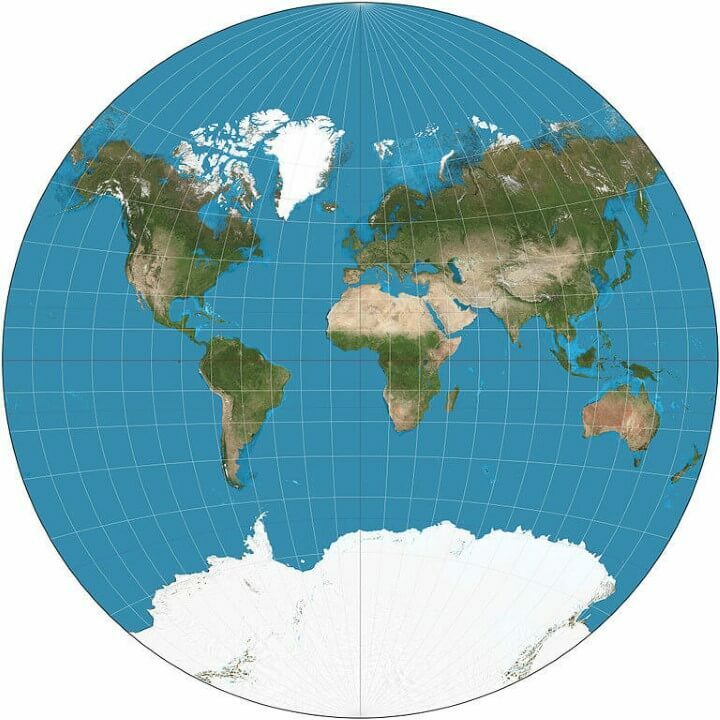 The Goode homolosine projection (or interrupted Goode homolosine projection) is a pseudocylindrical, equal-area, composite map projection used for world maps. Normally it is presented with multiple interruptions. Its equal-area property makes it useful for presenting spatial distribution of phenomena. […] an alternative to the Mercator projection for portraying global areal relationships. Goode offered variations of the interruption scheme for emphasizing the world’s land masses and the world’s oceans. In its most common form, the map interrupts the North Atlantic, the South Atlantic, the South Pacific, the Indian Ocean, and the entire east/west meridian of the map. What it says about you: You want to avoid cultural imperialism, but you’ve heard bad things about Gall-Peters. You’re conflict-averse and buy organic. You use a recently-invented set of gender-neutral pronouns and think that what the world needs is a revolution in consciousness. 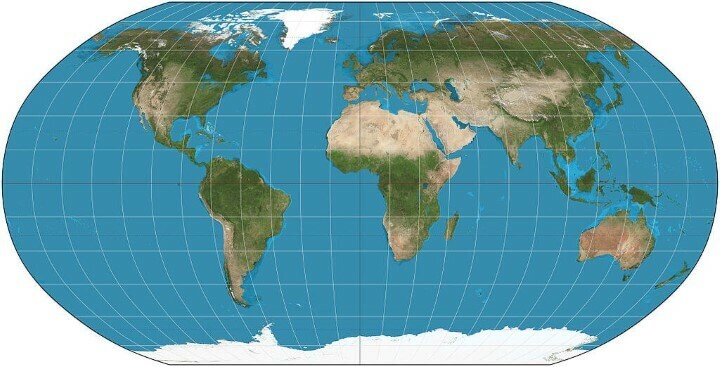 The Hobo–Dyer map projection is a cylindrical equal-area projection, with standard parallels (where there is no north-south nor east-west distortion) at 37.5° north and south of the equator. The original ODT map is printed on two sides, one side with north upwards and the other, south upwards. This, together with its equal-area presentation, is intended to present a different perspective compared with more common non-equal area, north-up maps. […] the map stretches the low latitudes vertically less than Peters, but at the price of greater compression near the poles. What it says about you: You think this one is fine. You like how X and Y map to latitude and longitude. The other projections overcomplicate things. You want me to stop asking about maps so you can enjoy dinner. The projection maps meridians to vertical straight lines of constant spacing for meridional intervals of constant spacing, and circles of latitude to horizontal straight lines of constant spacing for constant intervals of parallels. […] the plate carrée has become a standard for global raster datasets, such as Celestia and NASA World Wind, because of the particularly simple relationship between the position of an image pixel on the map and its corresponding geographic location on Earth. What it says about you: Yes, you’re very clever. 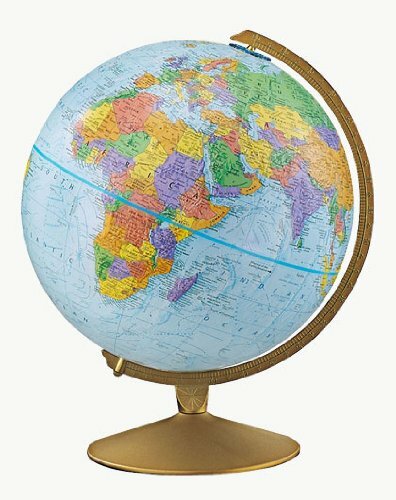 A globe is a three-dimensional scale model of Earth. Same shape as the earth. Can’t hang on a wall. What it says about you: Really? You know the Waterman? Have you seen the 1909 Cahill Map it’s based— …You have a framed reproduction at home?! Whoa. …Listen, forget these questions. Are you doing anything tonight? The arrangement is an unfolding of a globe treated as a truncated octahedron, evoking the butterfly map principle first developed by Bernard J.S. Cahill (1866–1944) in 1909. 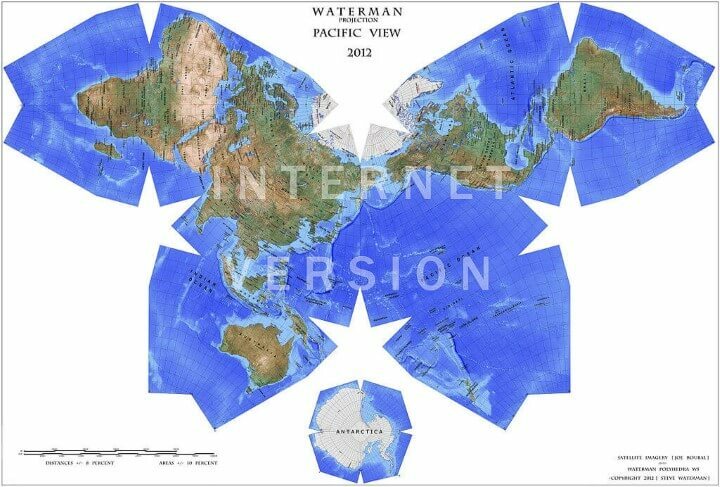 The Waterman projection show the equator clearly, as well as continental shapes, distances (within 10 %), areas (within 10 %) angular distortions (within 20 degrees), and relative postions, as a compromise: statistically better than all other World maps. What it says about you: You think that when we look at a map, what we really see is ourselves. After you first saw Inception, you sat silent in the theater for six hours. It freaks you out to realize that everyone around you has a skeleton inside them. You have really looked at your hands. It has been used recently to present spherical panoramas for practical as well as aesthetic purposes, where it can present the entire sphere with most areas being recognizable. It is conformal everywhere except at the four corners of the inner hemisphere (thus the midpoints of edges of the projection), where the equator and four meridians change direction abruptly (the equator is represented by a square). These are singularities where differentiability fails. the Peirce quincuncial has been rarely used for geographic purposes. What it says about you: I hate you. 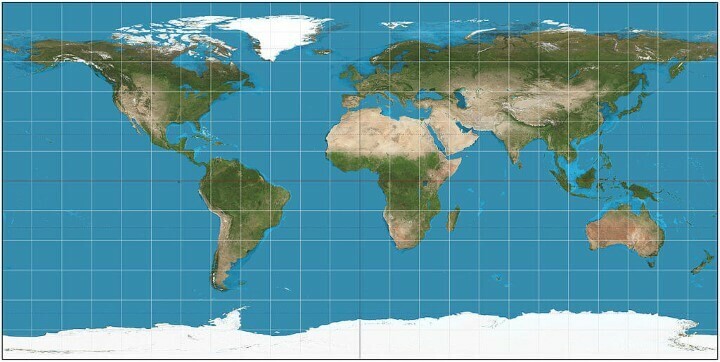 The Gall–Peters projection, named after James Gall and Arno Peters, is one specialization of a configurable equal-area map projection known as the equal-area cylindric or cylindrical equal-area projection. It achieved considerable notoriety in the late 20th century as the centerpiece of a controversy surrounding the political implications of map design. 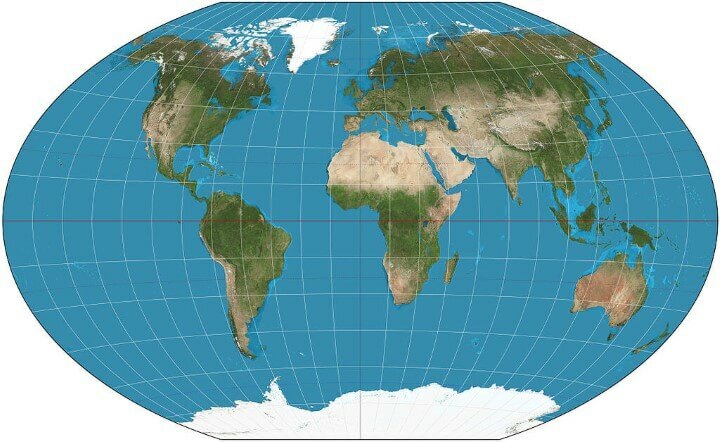 On Peters’s projection, […], areas of equal size on the globe are also equally sized on the map. Peters’s chosen projection suffers extreme distortion in the polar regions, as any cylindrical projection must, and its distortion along the equator is considerable. Several scholars have remarked on the irony of the projection’s undistorted presentation of the mid latitudes, including Peters’s native Germany, at the expense of the low latitudes, which host more of the technologically underdeveloped nations. The claim of distance fidelity is particularly problematic: Peters’s map lacks distance fidelity everywhere except along the 45th parallels north and south, and then only in the direction of those parallels. No world projection is good at preserving distances everywhere; Peters’s and all other cylindric projections are especially bad in that regard because east-west distances inevitably balloon toward the poles. For a further explanation of the comic please see 977: Map Projections on Explain XKCD. For even more map projections see: List of map projections on Wikipedia. So glad to be of help and really happy you enjoy this site. My favorite is Lambert Azimuthal Equal Area, centered at whatever place you might want. Highly distorted in the antipodes of the chosen center point, but very nice to show things around that point (and how they relate to that point). This was so helpful for my AP Human Geography class. I was able to get my assignment done so quickly! Was the Gall Peters map the same thing as a Peters map?